I have finished the Sewaholic Minoru jacket. 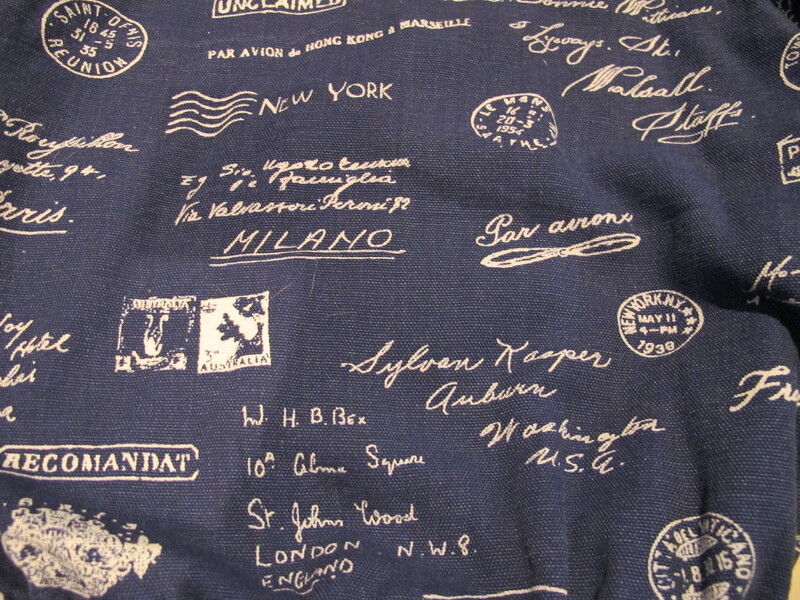 I purchased this fabric to make the Lisette Passport jacket – great idea, until I got home and realised they were postage stamps – not passport stamps. Doh! Then along came Sewaholic Minoru. I really like the pattern but I must say I’m not terribly fussed on my choice of fabric (I like the print just not the fabric itself) or my finishing. When I realised the things I did not like, I was ‘past the point of no return’ and the choices were to 1) ditch the project in a huff or 2) solider on. 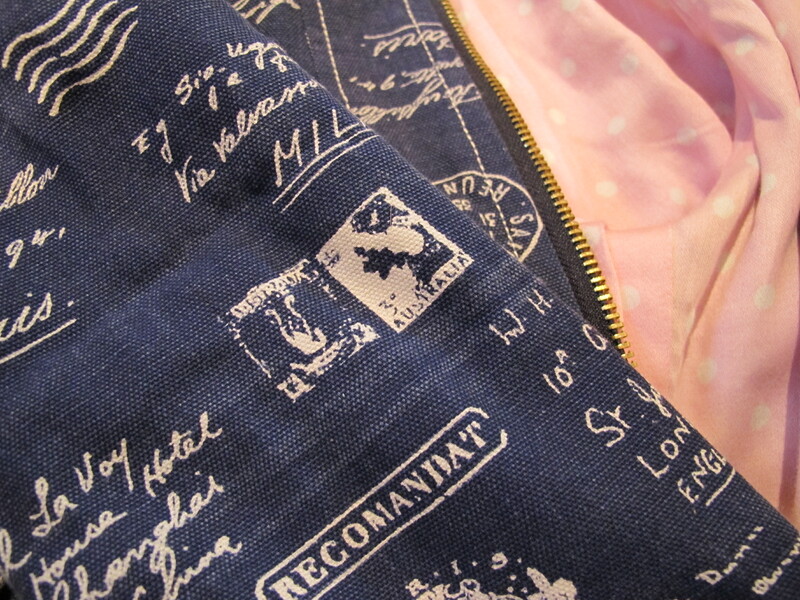 Sewaholic Minoru jacket fabric – postage marks! What don’t I like about my jacket? My topstitching is inconsistent and looks like I hired a drunk monkey to do it. Sewing in the hood zipper was just horrendous. I did it three times!! The stitching is wonky. I should have used a metal zip. But no, SillySewBusyLizzy decided to use a pink zip as a contrast. It’s a dress zipper and I’m not happy with the finish – and the hood shall hang out forever more! 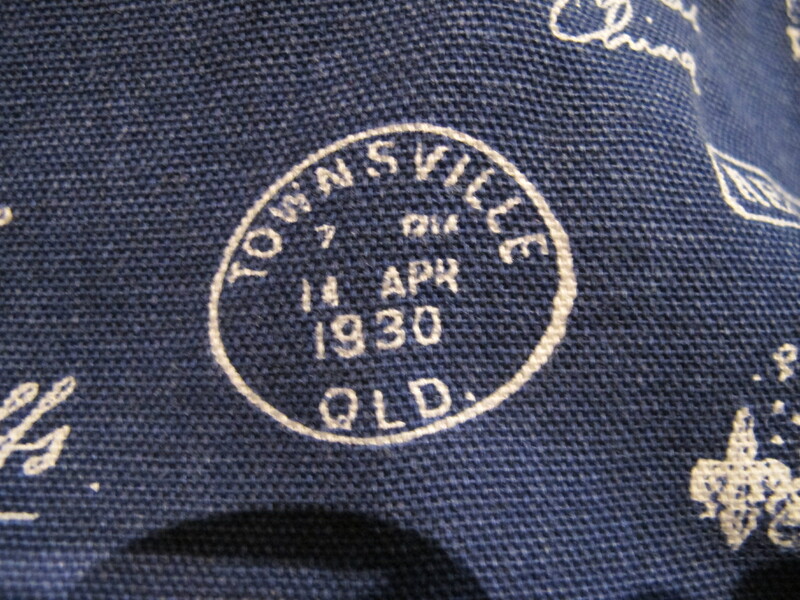 No needle seemed to agree with this fabric and worse, the print ink is quite heavy and the reverse is quite light. When the needle pierced it, the blue seemed to ‘break’ a little, and on the inside of the hood (which is only lined on one side because I used ‘stash fabric’ to line it and I ran out) you can see the lighter reverse of the fabric. The hood hides it (I had enough fabric to line the hood). It still annoys the little OCD person who lives inside me. There is a raw edge on the lower edge inside of the hood (that only I can see) – next time I would encase this with bias binding. The waist feels too high. The pattern calls for 2 inch elastic however I felt 1 1.2 inch was more than enough. I just need to drop the waist down a couple of inches. I only put in one inner pocket. I don’t actually think I would use the inner pocket much (unless I finished it with a zipper for security like SewMM suggested). But outer pockets? I miss those!! When I washed the fabric and it dried (yes, yes prior to cutting and sewing), it developed weird ‘worn’ looking creases in the blue background. I don’t actually mind it as I look like a parcel that’s been through the post several times… a worn battered package (probably a little close to the truth for comfort…). 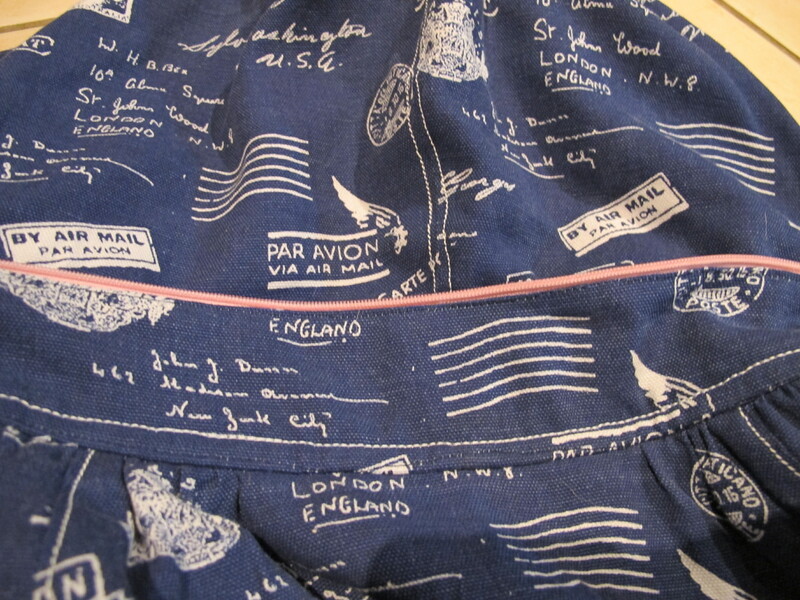 Sewaholic Minoru – the worn parcel look! 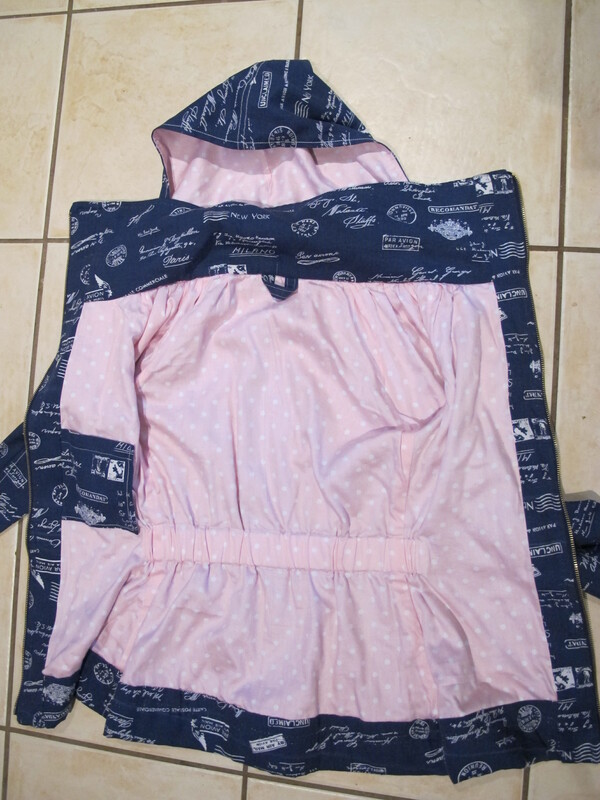 I got a bit ahead of myself when sewing and did some silly things – like not stitch across the bottom of the plackets when attaching the lining, stitching the lining all the way down on the front and a few other things. I would strongly recommended following the instructions and using the online Sewaholic sewalong – then it’s easy (Note to self: follow own advice more often). Will I make it again? Yes – despite all my bellyaching. What do I like about the Sewaholic Minoru pattern? There are not two-hundred-and-fifty bazillion pieces to cut out. If you go slowly and refer to the online tutorials, it’s not that hard to sew. No front pockets. I could have put these in – but I was cranky with the fabric and very very tired so I did not worry (a few days later I stayed in bed for 17 hours so that should explain some of my poor decisions!). How will my next Sewaholic Minoru be different? Front welt pockets or side in-seam ones. I’ll have to wear the jacket for a while and figure out where I would like to put my hands. Lower waist elastic. It is the right size across but the waist is waaaay too high. Put in both inner pockets. Make a tie belt and attach some belt loops. I have stacks of jackets – I adore them. It doesn’t get terribly cold here so jackets are great to throw on is there is a cold breeze or it’s early morning or late afternoon. There is always room for another jacket in my wardrobe! In closing, Miss 9 thinks this is ‘the coolest jacket’. I was surprised, she’s often embarrassed by me – not because I’m a dag but because I turn up to school in smart work clothes. Quote: ‘everyone knows who you are – they all go “Zoe, Zoe there’s your Mum” – that is soooo embarrassing’. 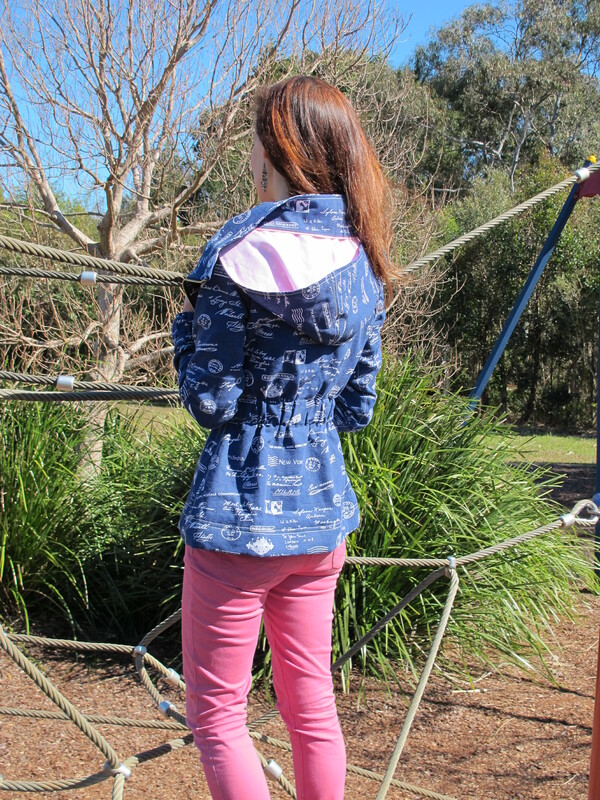 Last year she instructed me to wear jeans, sneakers and polar fleece – like other mums. The following day another mother told me her daughter had asked her to dress more like me – so you really can’t win LOL. Fabric: $10 metre from Spotlight. Lining: pastel pink polka dot cotton from stash.